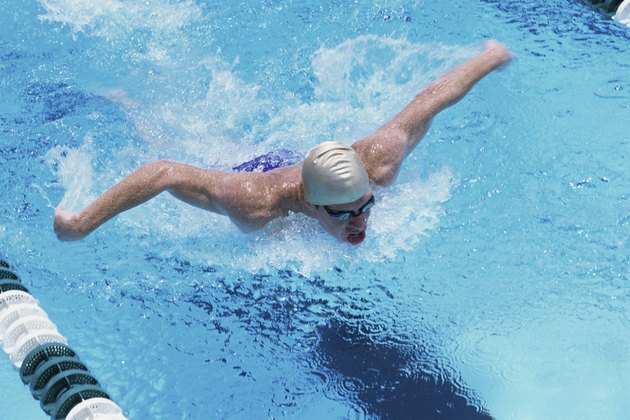 Swimming can be a bit of an obstacle for people who are nearsighted. The water can muddle vision through your lenses, but an even greater concern is having the glasses come off your face while swimming. If you have poor vision or are in a natural body of water, such as a lake, finding your glasses might be difficult or even impossible. It is important when swimming with glasses to make sure they are secured to your head. If you are a frequent swimmer, a second set of corrective eyewear might be a good idea. Use elastic eyeglasses holders to wrap around the back of your head and grip the glasses on their temple tips. These holders keep the glasses snugly on your head, eliminating the risk of losing them during a swim. You will get water on the lenses but will have a much-improved vision in comparison to your eyesight without glasses. Place large goggles over your glasses to limit water flow into the eyes and help hold the glasses in place. This isn't a big improvement over elastic eyeglasses holders, but a good, large pair of goggles can create a somewhat effective seal around the face and eyeglasses that reduces the amount of water getting on the lenses and in your eyes. Replaces glasses with prescription goggles. If you are going to be swimming a lot and need to wear glasses while doing so, consider getting a second pair of prescription lenses suited for the water. These goggles will give you the vision correction you need while limiting the water that contacts your eyes. Your vision will be improved both above the water and below it. Contact lenses might seem like a low-maintenance alternative to corrective eyewear when swimming, but bacteria and chlorine can become trapped between the lens and your eye, causing irritations and sometimes infections. Contacts also can be lost easily when swimming.